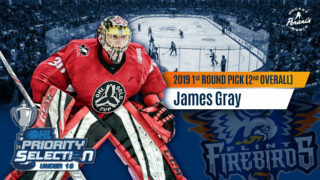 Flint, Mich. – The Flint Firebirds Hockey Club announced today that the team has completed a trade with the London Knights. In the trade, the Firebirds acquire forward Zach Grzelewski (pronounced Greh-Za-Lew-Ski). In exchange, London receives Flint’s 3rd round pick in the 2016 Ontario Hockey League (OHL) Priority Selection to be held in May. 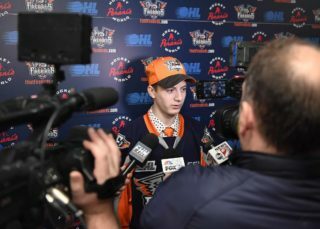 “Zach has an impressive track record so far, he’s scored goals at every level that he’s played at,” said Firebirds General Manager, Terry Christensen. “Zach has a high potential to provide us with an offensive spark this season and since he is a 1997 birth year, we could potentially have him in our organization for the next three years,” added Christensen. 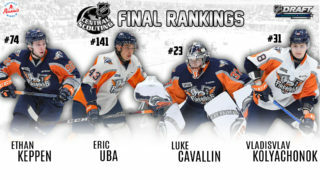 Grzelewski was a 6th round selection, 104th overall by the London Knights in the 2013 OHL Priority Selection. Zach recorded five goals while adding seven assists, totaling 12 points in 36 games played during the 2014-15 season with the Knights. Prior to playing for London, Zach was a member his hometown Thunder Bay North Stars of the Superior International Junior Hockey League (SIJHL) and talied 43 goals including 36 assists for 79 points in 53 games played throughout the 2013-14 season. Zach was also the Hockey Northwestern Ontario Player of the Year in 2013. “We had a few Americans in London that live in the Detroit area and you hear how big the hockey history is in the city of Flint and how it’s moving in the right direction. I’m looking forward to it,” added Grzelewski. Firebirds individual and season ticket packages for the 2015-16 inaugural season are on sale now and can be purchased at the Dort Federal Event Center Box Office, Monday thru Friday from 9 a.m. to 5 p.m. (ET) or online at Ticketmaster.com. More information on tickets can be found at FlintFirebirds.com or by calling Mary Nagy at the Box Office at (810) 744-0580. Opening night is Saturday, Sep. 26, versus the Saginaw Spirit.